Remember when you were young? All you wanted to see in the winter was snow, snow and more snow! Well Sophie wants snow too, more than anything else! “Snip, Snip, Snow” is the story of Sophie and her snow obsession. While Sophie lists the wonderful activities she is missing without the snow, her parents are citing the wonderful activities they don’t have to do without snow! Then one evening, snow is forecasted. Sophie prepares her tools for the snow. But, she is disappointed when no snow appears. At least they could make paper snow at school. Then it happens. The snow arrives! This story shows the delightful anticipation we all feel when we want snow. And the pleasure parents feel when it slows down or never appears. 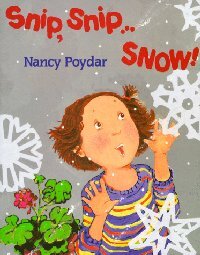 I recommend this story for 3-5 year olds who love snow! Show them how to make paper ones while they wait!